The Frog and Peach Theatre Company has done it again: another terrific, wonderful accessible production of Shakespeare. This time it's The Taming of the Shrew. While the company does not offer high production value, they make up for it with their intimate, conversational presentations from very skilled actors which far outweigh anything else. I am fine with not much set; the delivery of the language is so satisfactory. It's clear that these actors and their director Lynnea Benson fill the space of West End Theatre with an appreciative and innovative love of the the Bard's lines. This production is somewhat cut in a very neat manner and the time passes so quickly that it left me wanting more. I especially liked that it was mother instead of father who negotiates for her daughters Kate and Bianca. It gives it a more feminist view. Baptista, the mother, is beautifully played by Vivien Landau. Along with Vivien, standing out in the cast were Amy Frances Quint as Kate, Erick Gonzalez as Petruchio, Ryan Dreyer as Grumio, Lenny Ciotti as Tranio and Alexandra Poncelet Del Sole as Bianca. The entire cast is commendable. I especially loved Ryan Dreyer as Grumio - he delivers an absolutely adorable and comical turn (I can't wait to see him in another, hopefully leading, role). I adore this theatre company. There's something very special about being able to walk a few blocks to lose oneself to beautiful, practially lyrical, Shakespeare right in my own neighborhood. 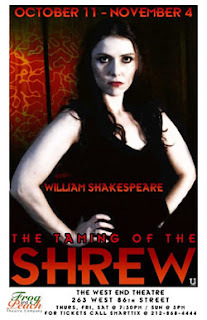 The Taming of the Shrew is running thru November 4th at the West End Theatre, at 86th and West End Avenue, upstairs at Church of St. Paul and St. Andrew. Tickets are available via Smartix online here or by calling 212) 868-4444. I agree with your Grotowskian point-of-view. Without truthful performances, high production value is meaningless.